As a digital nomad covering startup scenes around the world, I often land in a new city and have to get connected to local entrepreneurs for interviews. I’ve tried various methods, from searching for coworking spaces and startup organizations to asking for introductions to tweeting out a plea for help. I imagine entrepreneurs go through a similar process when they move to a new city and don’t want to stay home alone on Friday nights fixing bugs. Startups scenes around the world are vibrant and friendly; we just need a way to tap into them. 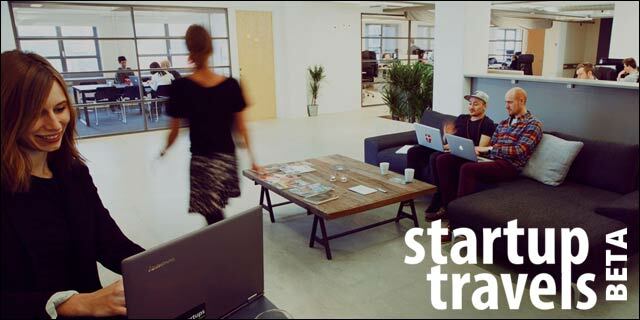 Well, a Copenhagen startup called Startuptravels launched today in public beta that promises to help. 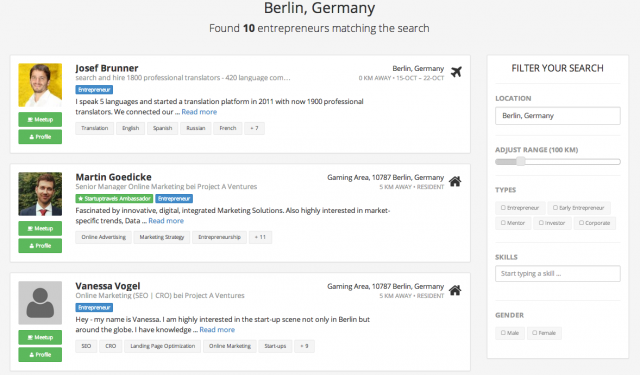 It’s basically a search engine for local entrepreneurs, or an AngelList for entrepreneurs to meet each other. You just enter a location, select who you want to meet (entrepreneurs, early entrepreneurs, mentors, investors, or corporate professionals), and add any filters for skills or gender. You can browse through everyone’s profiles, which include their background, education and experience, and upcoming trips. If someone catches your eye, simply request a meeting over coffee or send them a message. Presumbly, entrepreneurs are on this platform to meet and help other people, so you shouldn’t be shy. To keep the community high-quality, right now users have to be approved by the Startuptravels team, Anders Hasselstrøm, Henrik Haugbølle, and Rasmus Frandsen. Eventually, the whole community could help out in welcoming or rejecting new members. Pre-launch, Startuptravels had 9,000 entrepreneurs from 130 countries sign up. Many are probably travelers, stopping by for a few days and wanting to get plugged into the community without too much hassle. It’s still early and Startuptravels needs more users to be a truly useful resource, but they have psychology on their side. No one likes to be lonely – particularly in a strange, new city – and entrepreneurs are no exception.